If you do not want to dig into your community’s corpus funds to set up a costly infrastructure for composting wet waste, but have ample space in your apartment or gated community or resort, Up’Grade from Reap Benefit is just the solution for you. We have been using this method to compost all our kitchen since last August-September. I will explain the infrastructure set-up we have in place for a 202-unit complex which will give you a baseline to calculate yours. To compost wet waste from the current occupancy level of 135-140 homes, we have bought nearly 150 milk crates. That’s all the infrastructure you would need, plus a shredder to speed up the composting process and turnaround time. On weekdays, we generally need 5-6 crates; on weekends, 6-7 crates and on festival days, we need up to eight crates. One crate may suffice to compost 8-10 kgs of waste. 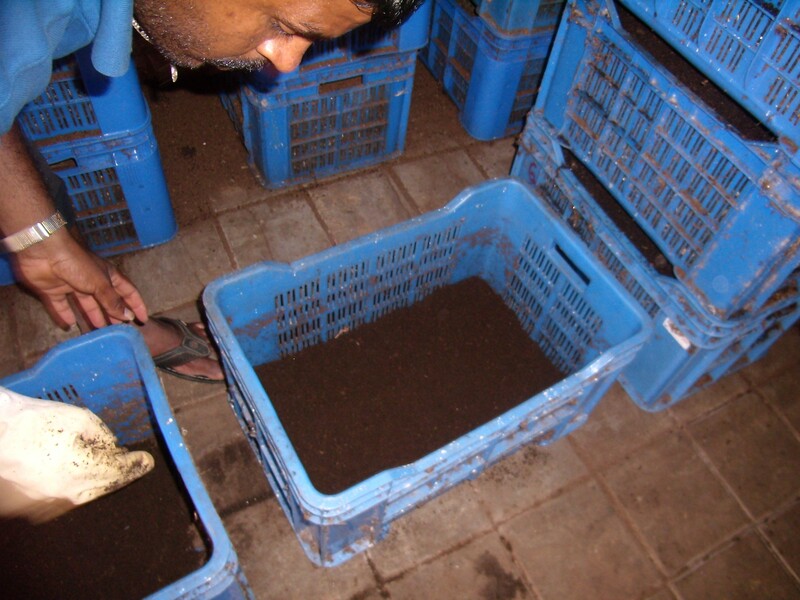 Up’Grade is a cocopeat-based inoculant manufactured by Reap Benefit, Bengaluru. This composting is aerobic. Loaded with micro-organisms which help degrade the organic material, this method does not allow loss of highly nutritious leachate. As a result, it takes away the need to drain out the leachate as and when required and of course, makes the compost that much more nutritious. Shred the kitchen waste. You can put both vegetarian and non-vegetarian waste. Put a two-inch-thick layer of Up’Grade at the bottom of the crate to avoid moisture content from dripping down. Take one part of Up’Grade and three parts of shredded kitchen waste and mix the two thoroughly using rakes. Fill the crate with this mix while leaving the 3-4 inches free on the top. Add another layer of Up’Grade on the top to prevent fruit flies from entering the crates. Initially, check the moisture content once in a while to make sure the composting bed is not dry. It should be moist enough to keep the microbial activity going. Once you get a hang of moisture control, leave these crates undisturbed for 20-25 days. Stack up the crates one upon another in rows. At the end of 25 days, you will have 25 rows of crates sitting. On the 25th day (no harm if you leave it for some more days), take out the compost, sieve it. You will get some small chunks of semi-done compost reject. This we use directly for large trees. They are doing pretty fine. Absolutely no bad odour issues. In fact, when I walk by the composting shed in our apartment, I have seen some residents sitting on a bench right in front of the shed and doing pranayama. That says it all! 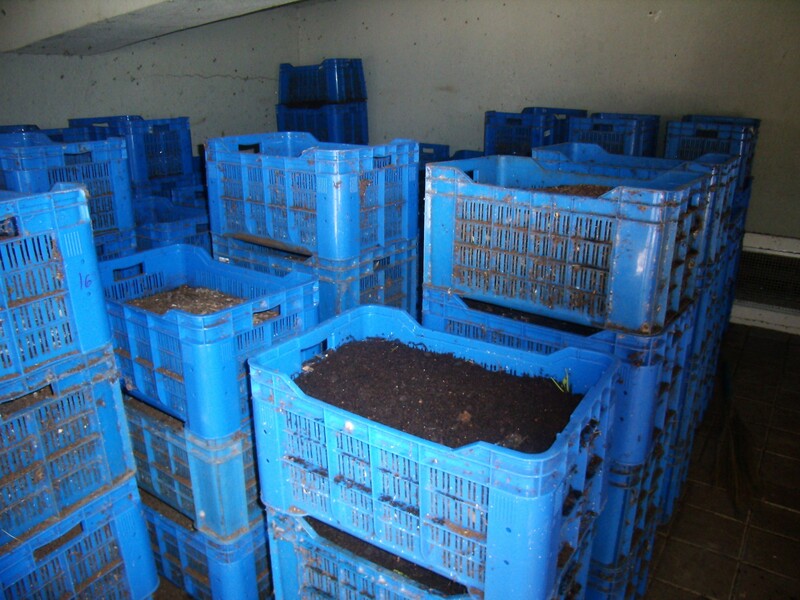 Since the perforated crates allow the air to travel through the small composting bed from all directions, the possibility of it rotting due to lack of aeration is very low. Since crates have to be left open, rats can easily attack them and even cut through the perforated parts. This is one hassle you will have to deal with by fortifying the room with a strong steel mesh. 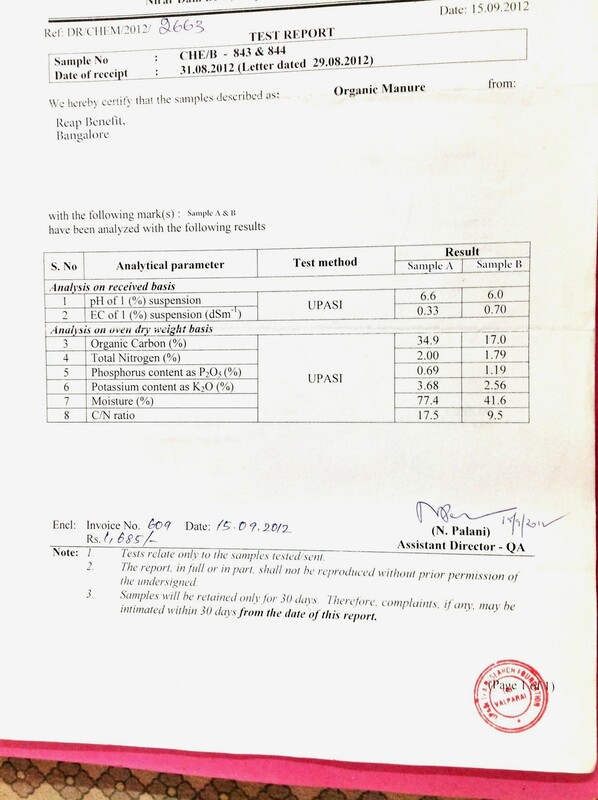 Please check the test results of this composting sample. In my experience, Up’Grade is one of the best organic manures and the effect of it is enjoyed thoroughly by the plants and trees in our complex. It has had an amazing effect on the lawn, in particular. Although we add many other ingredients to enrich the manure for our completely organic garden, I am sure Up’Grade compost lends the whole mass its own nutritious qualities. The smell of the mature compost is earthy, the texture is that perfect black tea powder and it is cool to touch. Thanks to the cocopeat used as a base, C:N ratio is balanced, this is what Kamal Raj of Reap Benefit says. Extremely low consumption. In fact, this method does not use water at all. You shred the waste and mix it with Up’Grade and then place it in the crates in a certain fashion. All the moisture present in the waste and the coco-peat is enough to keep the microbial activity on the uptick. Outgo on power consumption depends on the shredder you choose and the amount of waste to be composted. A shredder is a must for all composting methods to speed up the physical breakdown of the substrates and the turnaround time. Crates come in various qualities and hence, at varying rates. Multiply the number of crates you need with Rs 300-350. Each kilo of Up’Grade costs Rs 8, plus transportation cost. We buy a tonne of Up’Grade per month at Rs 9,000. It works out to almost Rs 60-65 per month per household. Put simply, Rs 2 per day per household. But the compost is of high quality and readily usable.If you decide to use this compost for your garden and factor in the cost incurred on buying fertilisers from outside, the Up’Grade operational cost goes down further. This entry was posted in Community Composting, Endlessly Green and tagged community composting, kitchen waste composting, Up'Grade for community composting. Bookmark the permalink. ← Mandur is shut down & Bengaluru is on the brink, are we ready to evolve yet? Can you please let me know what other organic ingredients you add to this compost to make a wholesome manure? Neem powder to control termites/ants, ‘ganjala’ (for urea supplementation), our own vermi-compost. thanks.. can you let me know what is ‘ganjala’? 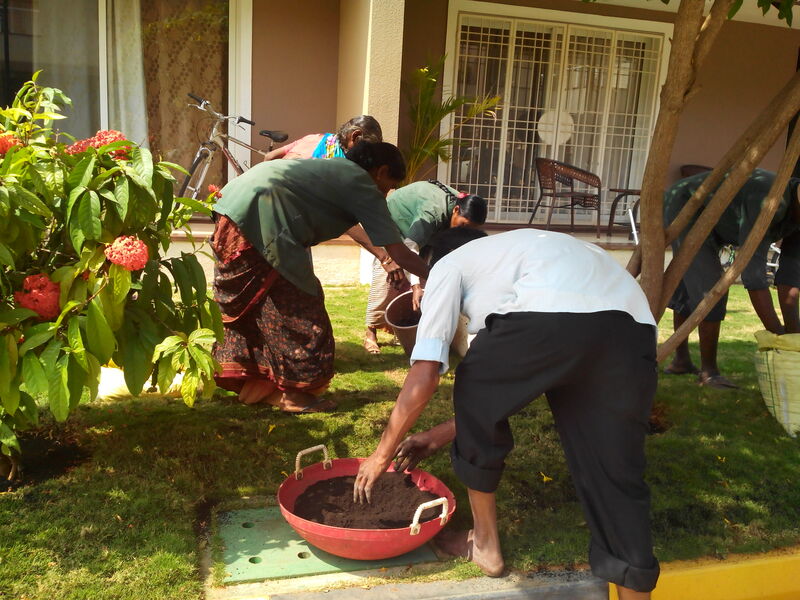 Thank you so much Savita, for such a comprehensive treatise on community composting. What tpe of shredder do you use. please would you put up a picture and also tell us estimate of costs. if there are different types of shrededers, may be even an article on that too would be great ? Ma’am which shredder do you use? Can you please give me the contact of the manufacturer? Hi Lakshmi, sorry for the delayed reply. We use an old one which was manufactured by a local engineer. I think you skip that and consider options from MK Associates. They have a range of shredders. Also, check out my review on Tallboy from Riteways. They have got a good shredder, too. Beyond this, I have no idea about any other shredder that selling in the market. Thanks. Hope it helps.